First impressions are always a must. Be it in an interview or for the first day at a job, creating a good impression can do good for you in the long run. Making a first impression at work is really necessary in the corporate world as it can help the employer judge the candidate within a short amount of time. For example, within three seconds the employer can judge and learn about the employee. It depends on how the person carries himself or herself in different situations. This includes how he or she manages the time given, how well do they converse with their colleagues, how well do they behave with their fellow peers, how are they in front of their higher ups and so on. This is the most important part. 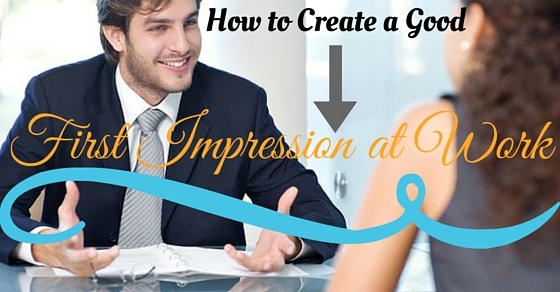 While creating a good impression, try to think of the person or the individual that you are trying to impress. This is the most important place to start when you are trying to impress through your work and behavior. Try to find out who are you trying to impress, this will help you to create the necessary actions needed to influence that certain person. This also helps in different scenarios such as when attending a dinner party or attending a social gathering, try to impress the people you are supposed to. Otherwise, if you are trying to impress a whole group of people, then you will be seen as a show off who is trying to show his/her skills. This is not a good apprehension, especially in the corporate world. Try to find out the names of the people that you are going to meet. This helps in eliminating the first-hand awkwardness that you get when meeting a new person for the first time. This can be done by trying to find out their names through mutual friends or by searching on the internet or viewing their Facebook or LinkedIn profiles. Try to learn about the views, aspirations, hobbies and other interest about the person that you are going to meet. This is necessary as this creates a feeling of familiarity between the two parties. Do not get into too much detail about the person, as the other person will think that you have researched quite a bit about them. Try to casually introduce the topic and talk according to the flow of the discussion. There is always one motto when venturing out into a new environment, especially on the first day of a job, always be well prepared. After doing proper research about the individuals that you are going to meet, try to practice and frame questions and also add examples from your experiences to add to the conversation. This helps to create a bond between the two individuals and helps to keep the discussion alive. Also, try to remember that do not try to memorize and learn all the details that you know about the individual. The main aim is to prevent your first impression just stiff and devoid of fun. Knowing facts about the other party helps you make a lively conversation. Try to practice to make yourself comfortable when talking to a new person. This prevents your nervousness to take over and make you grasp and struggle to search for new topics to discuss. Even if you do not have a clear idea of who you are going to meet, you do know that you are going to meet someone. Try to prepare some general points for discussion and try practicing by looking in the mirror by yourself or try practicing it with a friend. The key is to be familiar and comfortable. This encourages the other party to be more responsive within the conversation and makes the conversation more interesting. The more calm and composed that you feel, the better the impression will be for the other party. This tip can act as a game changer for most new employees. This is another important aspect that is necessary while meeting a new person. Try to dress the part and act like it. The main purpose is to carry yourself in such a manner that people will feel comfortable talking to you and try to approach you first. This is taken as a good sign. Also, you will also be entitled to good compliments when you are dressed smartly and nicely. Although beauty is subjective and it depends on the eye of the holder, it does not change the fact that a person should try to look his very best when meeting a new individual, especially during a job. Try to wear something that you are comfortable in. Also, do not try to overdo the aspect of comfortability. Being comfortable while wearing clothes does not mean that the individual could wear a casual outfit while attending a formal event. Try to dress the part and look good. Also, do not try new things while joining for the first day at the job. For example: if you are a person who always wears spectacles to work, do not try to experiment and wear contact lenses on the very first day of the job, as this can cause unwanted difficulties for you and maybe to your peers also. Slowly, transition into things that you feel are new and fresh. Having a positive body language can make yourself more approachable and down to earth. Having a good body language and a good smile are indicators that you are friendly and cordial in nature. It helps to make a good first impression at work for those who meet you for the first time think that you are friendly and nice, just on the basis of your smile and your behavior. This can be very useful in the industry. Smiling adds as an extra benefit to this. Moreover, when a person first meets an individual, the first thing that they always notice is either the eye or the teeth. Hence, this fact has scientifically proven that a good smile is always a vital part of making a good impression. Moreover, a person who smiles more is often considered more trustworthy than people who sulk. A great smile often helps you to be seen as an easy to talk person. Furthermore, a great smile can also help you to improve your overall attitude about yourself. A great attitude can create a great impression about unconsciously within the minds of other individuals. Being smart is also a great benefit along with a great smile. This can be a great determinant on how people tend to perceive and look at you. Moreover, it is hard for an individual for a person to be uninterested, aloof, rude or angry when they are smiling. This can come in handy when working in a really stressful and busy environment and thus helps in eliminating any form of misunderstandings and disagreements between colleagues in the future. A workplace etiquette is very much required when joining for a new job. The employee should be ready to accept any form of guidance and advises, even if they like it or not. This is necessary for creating a good and long lasting impression towards your employer as the employer will feel that you are a person that is ready to take on advice and apply them to constantly update yourself. It also shows that you are welcome to new changes and you are open to new things. Try to be humble as possible and also refrain yourself from making comments in which you compare your new workplace to the old one. This can irritate the employer if you keep on complaining and comparing your new job with your old workplace. It is necessary to keep acquiring knowledge from your previous job, but do not try to keep implying that your old methods were better. This shows that you are not susceptible to any kinds of changes or reforms. Be open and receptive and try to learn about new things as much as possible. A good method to impress your boss is by trying to volunteer in the various other activities of the company. Before volunteering, try to be comfortable and get used to your position within the company. Also, try to give a good performance in all the tasks that you are given. This shows the employer that you have the potential to be a versatile employee. After, a certain amount of time working in a specific area, try to venture out into other areas, or try and join different communities within the company. Doing this can have multiple benefits, this can act as a chance to meet new colleagues within the company, demonstrate your leadership skills and show that you are a good team player and you are considerate of others..
One of the main factors that should be kept in mind is that taking up multiple roles simultaneously should not interfere with the main work or the work that you are entrusted to finish. Check yourself from time to time and make sure that you are on the right path of progress. When venturing for a new job, it is not advisable for the employee to ask to arise suddenly to the employer. Do not try to negotiate with the higher ups. Hopefully, try to have a negotiated salary and other perks before you join the job. If you are in a hurry to provide a negotiation to your employer, try to wait until you get a good review about your performance. Slowly try to impress the employers with your work and performance. Once you have been established as a valuable and an indispensable part of the organization, then only try to negotiate your salary. Try to convince the employers how you can improve your performance by increasing your salary and providing more added benefits. This also includes scheduling changes and requesting any other non-standard requests. Try to stay away from colleagues and other individuals who like to spend time by gossiping about others. When a third person knows about this, Then it’s a loss of the first impression at work. Try to be concentrated about your work and life rather than being interested in others. This does not mean that you should not talk to co-workers at all. You should talk to them, but try to keep the conversation small and limited. Do not try to talk about the details and private affairs about others. If your company provides you with a new mobile phone, a new workspace, a new system or software that is not up to your liking, then do not try to accommodate these things in the first few days of joining the organization. There will be a time where there will be a chance to discuss the new workspace and software, but the first few days is not the time to ask. Unless you have specific accommodations due to health issues, it is not wise to ask for upgradation. After a few weeks or months, or when you have proved to the company that you are a valuable employee, then only ask for an upgrade. This is the most important factor that one should keep in mind when joining for a new job. Always be prepared and give yourself more time when needed to appear for the first day at work because it effects your first impression at work. Always set aside time for any traffic hassles or any last minute emergency situations while commuting to work. This shows how well prepared you are for the job and how you can manage time effectively. Moreover, always try to be a bit early than the allotted time. This shows that you are enthusiastic and eager to join the company.